Today's the first time I've worn a tab collar since I started the blog. It's basically a straight collar that has a piece of fabric attached to each side. The ends of the tabs have some sort of fastener so that the tabs can be put together after the tie knot has been snugged up. This particular one is a snap tab. I also have a few that use a button and a loop of fabric for the fastening. Tab collars are pretty useful for keeping the tie knot pretty much in place all day. It's also said that it pushes the tie up away from the front of the shirt. I guess that's desirable. 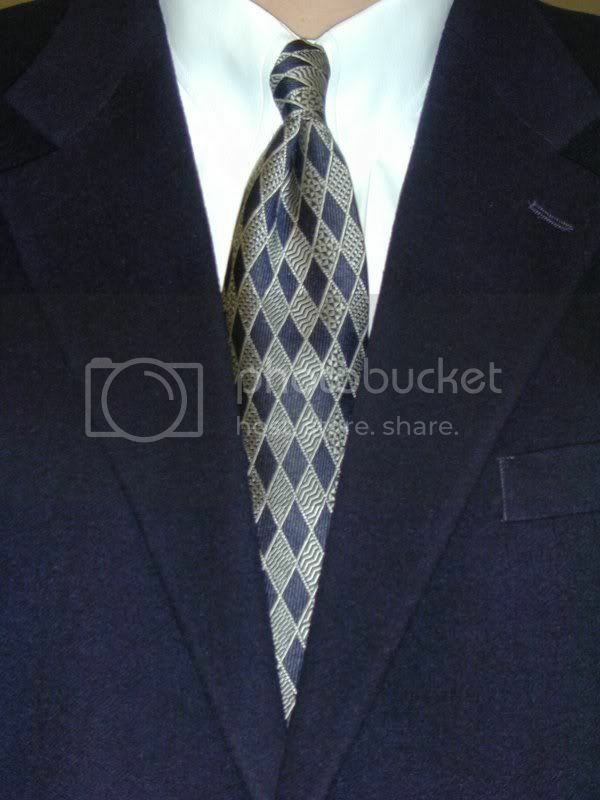 It also pulls the collar down some which makes it look like the knot gets pushed up more. At any rate, it is definitely a type of collar that places more focus on the knot. The necktie selected for today's conglomeration is another Ferrell Reed, City of London. I chose it because it makes a fairly small knot. Tab collars look strained and a little funny when they have to try to contain big knots. It has a navy background with silver diamonds woven "on top". There are four different patterns in each column of diamonds. I believe the overall pattern is called harlequin and this site makes me think I might be correct. The navy sportcoat rounds out and tops off the conglomeration. I don't know how I'd make it to work on Mondays without a navy sportcoat in the arsenal. My favorite type of collar, which I just discovered a few years ago, is the "hidden-button" collar (there's a picture of one here). It eliminates fussing with collar stays as in a regular straight collar, you don't get the sometimes off-kilter collar roll of a regular button-down, and it leaves more room for a tie knot than a tab collar. They're hard to find, though, and I only have one. That is a great type of collar and I also have one or two. They seemed to come into favor with Tim "The Tool Man" Taylor wearing them on Home Improvement. Paul Fredrick used to have quite a few but now they only have them in sportshirts. It is an option with their custom shirts too but that can be a bit pricey. Anything that Tim "The Tool Man" Taylor would wear cannot be recommended, as he is surely one of the world's worst dressed men. Tab collars are difficult to get - especially in a slim fit - Brooks Brothers sell them only in their 'classic' (i.e. 'tent') size. Even their 'slim fit' button downs are enormous. For slim fit tab collars you might want to try Paul Fredrick. They have several in button and French cuffs. I have worn their shirts for quite a while. Although they were much better before they moved their manufacturing to China.